There are a select few places in my hometown to go if you want to get good fried chicken. I hope I’m not stepping on anyone’s toes when I say this, but Kentucky Fried Chicken does not happen to be one of them. While I personally don’t think that their chicken is nasty per se, I don’t feel like it’s as good as it used to be in the early 90’s. Ever since KFC tried to ‘keep up’ with the other fast food chains and their ever evolving and growing menus and adding a bunch of other extraneous stuff, I feel like their chicken has suffered in quality. I understand that businesses want to keep up with the Joneses. However, when you’re good at one particular thing, sometimes you just need to stay in your lane, you know what I mean? When I was a freshman in high school, my city got our first and only Popeyes Chicken- and you would have thought that the Pope had come to town. For two solid weeks, that place was absolutely packed to the max, with the line for the drive through going clear down the street. Not that it was unjustified- Popeyes chicken is a major step up from KFC in terms of quality in general, and their biscuits are to die for. However, that furor died down and these days, while the chicken is still usually pretty good, there are some days that are largely hit and miss. There used to be two Ponderosas in my city as well, and while I’m not a huge fan of buffet food, I will say that their chicken wings/drumsticks were very delicious.However, they’ve both closed now so that point is kind of irrelevant at this point. We have a business down the street from my house that serves up chicken, gizzards and standard Southern sides. The food is pretty decent, however I was put off the last time that I went there this past winter and saw that the owner was so cheap that he didn’t turn the heat on and the employees were working in their coats just to stay warm. Not only does that strike me as unsanitary, but I was appalled at the idea of an owner that would force his employees to work in those conditions. Haven’t been back since, suffice to say. As decent as those other places are, everyone in my city knows that the best place to get fried chicken, is (rather ironically) a fish market. Inside, it’s a room of glass display cases filled with various fish to buy whole and fresh. In addition to the fish, they also for some reason have a whole array of Southern style food that they make to order in the back. The place is kinda small. And being a fish market, it stinks. However, it does serve the best chicken you’re going to get in the city. It’s so good, that nobody even calls it by it’s true name. It’s gained a catchy little nickname over the years instead: “Crack Chicken”. Maybe I should have added a caveat to the beginning of this post: there a select few places to go in my city to get good fried chicken if you’re going out to eat. If you want the best fried chicken period- well, not to blow my own horn or anything but…then you need to come to my house. I make really, really REALLY good fried chicken, guys. It’s just the truth. I’m not a fan of how messy and greasy it can get sometimes, and it did take me a while to learn, but once I did, I really hit my stride. Good things come in 3’s, right? I don’t know anyone that would disagree with that when it comes to triple dipped fried chicken.The skin is the best part; the crispier the better. 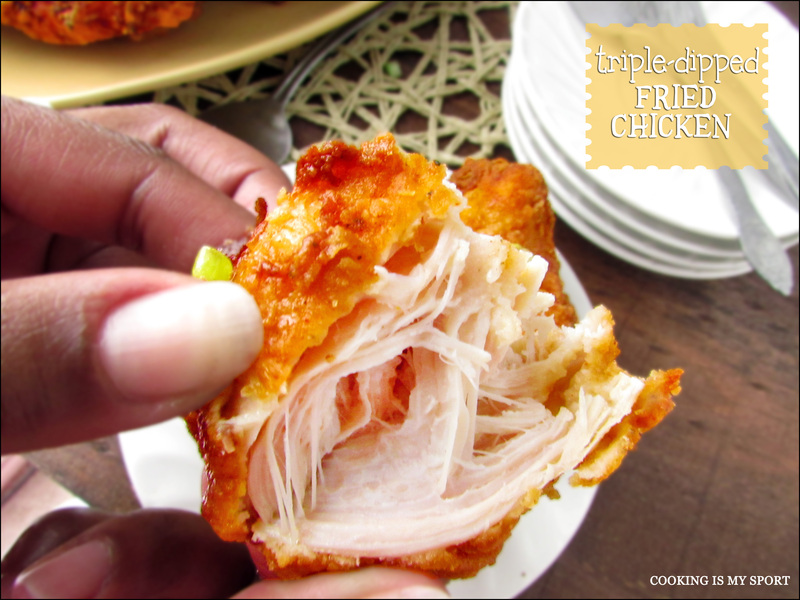 So with a triple dip, you better believe this chicken is the real deal when it comes to the crunch. I made this chicken for my family as part of an authentic Southern meal alongside these Hushpuppies. It was a hit. 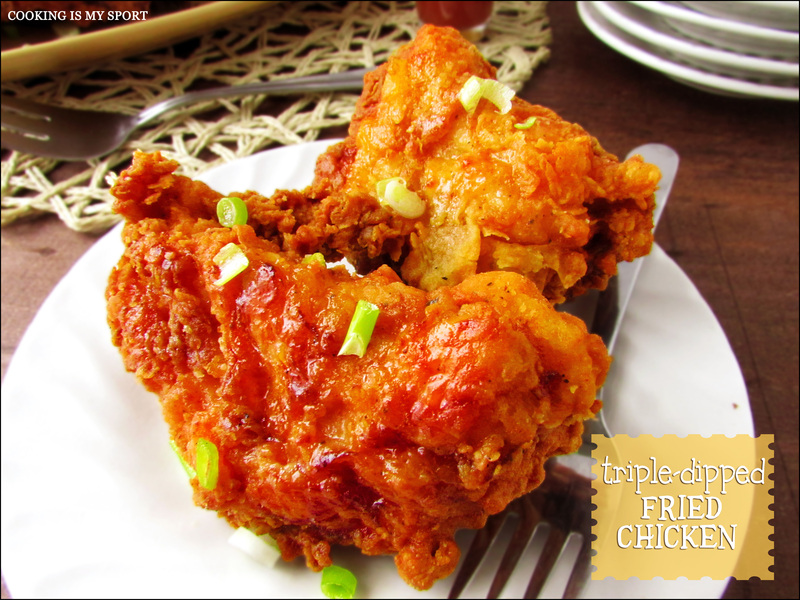 But c’mon: triple-dipped fried chicken? How can you go wrong there? 1. In one medium bowl, mix together 3 cups of flour, garlic salt, 1 tablespoon black pepper, smoked paprika and poultry seasoning. 2. In a separate bowl, stir together 1 1/3 cups flour, salt,1/4 teaspoon of pepper, egg yolks and beer. You may need to thin with additional beer if the batter is took thick. 3. 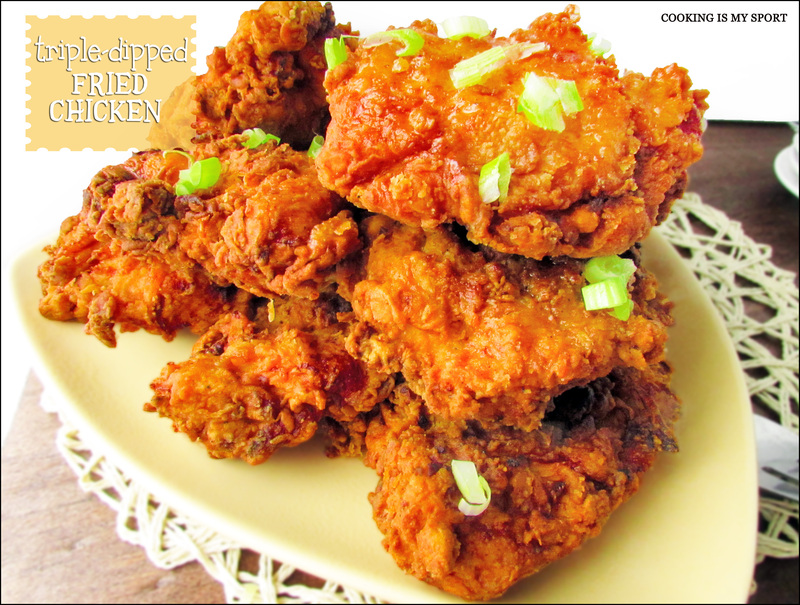 Heat the oil in a deep-fryer to 350°.Moisten each piece of chicken with a little water, then dip in the dry mix. Shake off excess and dip in the wet mix, then dip in the dry mix once more. 4. Carefully place chicken pieces in the hot oil. Fry for 15 t0 18 minutes, or until well browned. Smaller pieces will not take as long. Large pieces may take longer. Remove and drain on paper towels before serving. Oh yum! Homemade fried chicken is the best! Luckily I live in the South so we still have several local places that make good fried chicken. Someday I will make my own, just not yet…. I’m sure I will soon enough, though not til it cools off. 100 degrees is too hot for me to think about frying! Oh my gosh. Those pictures. Holy smokes lovey. I want that chicken….and I want it NOW!! I’m totally stinking up my house this weekend…I don’t care. I need to try your recipe!! Creative you are, but unlucky me can’t taste this…. Ummm…what time is dinner?? I will be there and I won’t be late. 😉 There is no doubt in my mind, via looking at these photos, that you have mastered the frying of chicken! Go ahead, toot your own horn…this definitely appears tooting worthy. 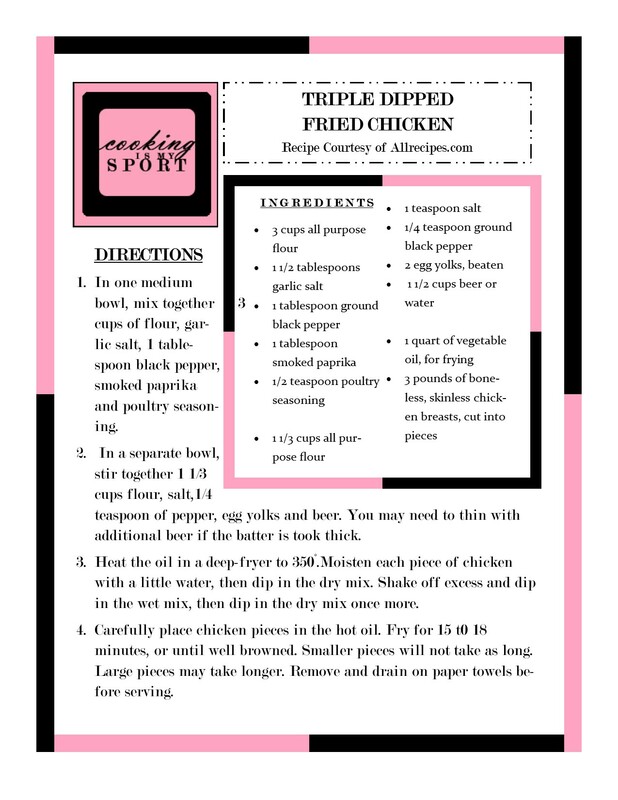 😀 I’m printing the recipe now…thanks! Thanks Nancy- c’mon over anytime, you’re more than welcome 😉 I think you’ll be happy with this recipe, I know my family was! Drool drool Jess. This is getting made soon !!! It looks so crazy good!!! Please do and tell me how you liked it- thank you! OMG. You are killing me Jess!! Looks incredible…and where is this fish market? 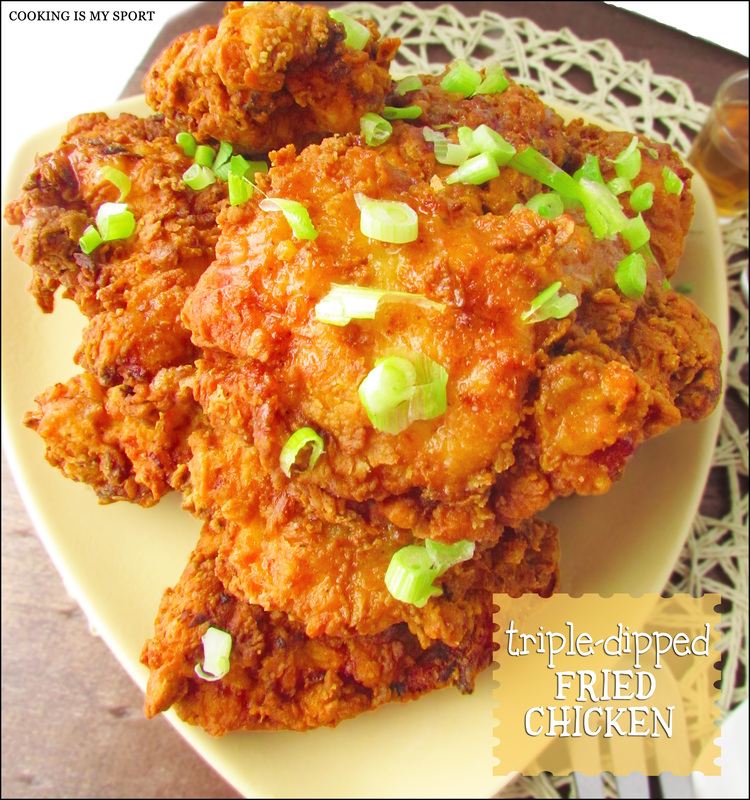 Triple dipped fried chicken sounds like the perfect way to enjoy. 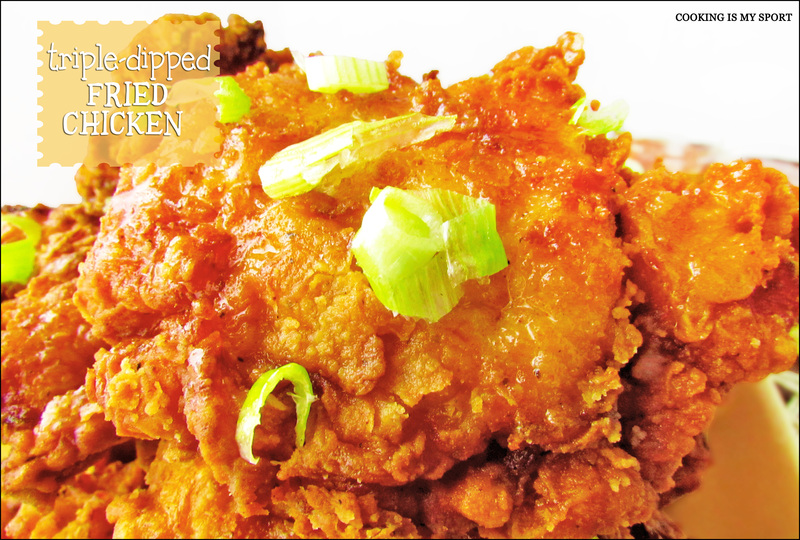 You don’t eat fried chicken as diet food, it can be greasy but it needs that thick coating of crispiness to be the real deal. Love your recipe. This would definitely be a guilty pleasure! Jess, you have truly done an amazing job here with this chicken! It looks so perfectly crusted and crisp and fresh and the shot of the piece of chicken torn open is making my mouth water! Great job and thank you for this recipe, I will be trying it soon and I’ll let you know how it goes! When ever I am in the states or the UAE i HAVE to have popeyes.. i still remember the first time i found it in Chicago.. in the most amazing building! your chicken though looks like snoop himself would sit at your table.. an I would be first to snaffle a piece! great post! Are you aware that your chicken is absolutely deep-fried? And looking at the ingredients it seems very very tasty…. in case you’ll have some leftovers, please let me know…. thanks a lot for being at FF this week, is very funny co-hosting with recipes like yours! Thank you Margy- it’s about as deep fried as you can get, but the taste is just amazing! Trust me, no greasy skin here- it’s pure crunchy goodness. Thank you! I agree. Go big or go home. This chicken looks divine. oh! I totally love your chicken! Yum Yum, Jess, these sure look so good! I confess, I am a huge fan of crispy chicken skin, even as a kid! I have to try these! I agree- you MUST lol Thank you!